Edited by Gregory G. Brown . The development of technology in the early 1970s for propagating targeted segmentsof DNA in bacterial plasmids and viruses, molecular cloning, created a revolution in the biological and biomedical sciences that extends to this day. The contributions in this book provide ample evidence of just how extensive the applications of molecular cloning have become. The chapters of this have been organized largely according to the fields this technology is being applied. 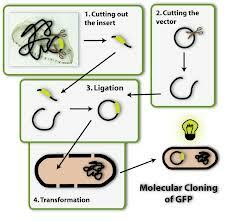 Two chapters deal with the recent advances in molecular cloning technology per se. Padmanabhan and colleagues review various methods for cloning in E. coli plasmid vectors, emphasizing the shortcomings of various procedures for identifying clones of interest. Abbas Padeganeh et al. provide an interesting discussion of non-viral systems for gene delivery into mammalian cells, with an emphasis on the relatively new “dendrosome” technology. Several chapters deal with the use of molecular cloning techniques for obtaining and characterizing purified animal proteins involved in cancer and aspects of cell biology. The proteins thus characterized include human cathepsins (Wen et al. ), a human WAP-like domain (Jayanthi et al.) and potential antibiotic peptides from amphibian skin secretions (Zhao et al.). Three chapters, those of Sonoki, Crespo et al. and Esteso et al., deal with the applications of molecular cloning methodologies to improving our understanding of immune system, while the chapter by Hanif and colleagues deals with the use of the methodology for the production of antigenic peptides and vaccines. Applications in the area of toxicology are reviewed in the chapter by Radis-Baptista, while more specific application of the technology to the purification and characterization of a toxic enzyme from spider venom is covered in the chapter by Tambourgi et al. The contributions of Ogbunude et al. and Jarilla et al. describe the cloning and expression of potential therapeutic targets for trypanosomal and trematode parasites, respectively, while Shahein et al. describe the use of whole genome sequences as a means of developing anti-parasitic vaccines. Liu et al. and Chen et al. describe applications to phylogenetic questions. Finally, two contributions in the area of plant biology are described. Sottomayor et al. describe how molecular cloning technology can be used to understand the complicated pathway by which the anti-cancer terpenoid indole alkaloids vineblastine and vincristine are synthesized, while Brown and Gaborieau discuss the application of positional cloning with the complex genomes of polyploid plants. There is, in short, something for a wide variety of readers in a truly diverse set of scientific fields.